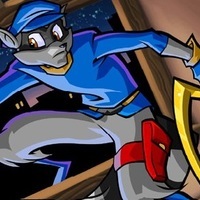 Casting Call Club : Sly Cooper Issue #2 Comic Dub/Drama! Casting Call for Sly Cooper Issue #2 Comic Dub/Drama! Sly Cooper Issue #2 Comic Dub/Drama! Sonic The Hedgehog Champions Parts 1 & 2 Comic Dub! About Sly Cooper Issue #2 Comic Dub/Drama! #1. You Need A High Quality Microphone. #3. Put Emotion into your Lines, BE The Character. Sly is a cunning, devious, quick-witted, charming, suave, gentleman thief. He uses his wit, courage, charm and skills to pull off jobs, and often crack jokes and sarcastic comments at the expense of others. Sly is also very cool, collected and manages to keep a rational head in stressful and chaotic situations. Despite being slick with the comebacks, his girlfriend, Carmelita Fox, becomes increasingly infuriated with him, especially during their travels through time. Through all of his hardships, he remains loyal and dedicated to any he calls his friend, especially his lifelong friends, Bentley and Murray. [Narrating] "...The Life Of A World Famous Thief Is Never Lacking In Variety...One Minute You're Eating Caviar On The Riviera...The Next Minute You're Smacked In The Face By A Pigeon With A Note Tied To Its Leg...And Before You Know It, You're Sneaking Into You're Own Worst Nightmare." "Officer Jones Has The Night Off. Well, I'm Not Much Of A Crooner, But Maybe This Will Ease Your Troubled Mind." Jim McSweeney is a retired criminal who worked with Conner Cooper and Dr. M. His role was very similar to that of Murray's; he was the muscle of the Original Cooper Gang. He is currently living in Heathrow Penitentiary as an inmate. Like Bentley and Murray, McSweeney shared a brotherly relationship with the Cooper family member he worked with. 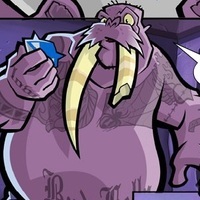 As a result, McSweeney is a sort of uncle figure to Sly Cooper. Following the schism of his gang and the betrayal of Dr. M, McSweeney had nowhere else to go and thus turned himself in to the authorities, who placed him in Heathrow Penitentiary. However, before doing so, he hid a map to the Cooper Vault in a museum on the Ligurian coast of Italy. Upon learning of Sly's continued existence after the attacks by Clockwerk and the Fiendish Five, McSweeney summoned Sly to his cell with courier pigeons. After Sly passed his identification test, McSweeney revealed that escape from prison was not his intention. Instead, he wished to tell Sly about the map. After McSweeney told Sly about the map, Sly left the prison to go retrieve it. [In A Cold & Bitter Tone] "Hey, You're Not Jonesy....That's Too Bad. His Lullabies Are The Only Things That Can Get Me To Sleep On Nights Like This." [Surprised in An Almost Disbelief Tone] ".....Well, Ain't That The Darnest Thing...I Should've Tried Pigeons Years Ago....What, This Supposed To Mean Something To Me, Pal?" [In A Slightly Bitter Tone] "You Mean...Am I The Same Big Jim McSweeney That Ran With The Original Cooper Gang? The Same Big Jim McSweeney That Used To Bounce A Little Snot Nose Kid Named Sly On His Knee Between Jobs?..." Unfortunately for Winthorp, who secretly admires Carmelita, her preoccupation with her work prevents her from noticing his innocent affections. 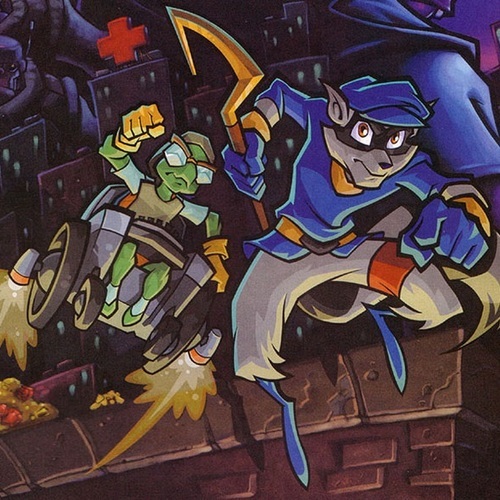 To top it off, the dweeby, out-of-shape Winthorp cannot possibly compete with the charming, athletic force that is Sly Cooper. Give him a nerdy, socially awkward, dorky, dweeby sounding voice. (More details are in the explainer video above) I mean, just look at him use your imagination! XD LOL! [In A Shy & Nervious Tone] "...Er, Uh...Hey Carmelita... Just A Quick Question I Had For You. Do You, Um... Believe In Love At First Sight?..." "Oh...Because...I...Um...If Not, I Could Always Walk In Here A-A-Again. Aha-Ha-Ha-Ha....G-G-Get It? Pretty Funny Joke, Huh?" 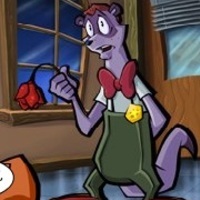 "Uh, Speaking Of Smells, I've Been Meaning To Ask You This... Would A Rose, If It Was Named Carmelita, Smell Even Sweeter Than It.........?" Mz. Ruby is a particularly cold and dark individual due to years of isolation in her early childhood. Despite her eventual use of magic in order to make friends, she later employed these abilities in a life of crime. She is somewhat maternal towards her zombie creations, calling them her children. Mz. Ruby possesses an eccentric and sadistic sense of humor, quite delighted at the thought of Sly dying. She had ambitious plans to use her dark creations to take over Mexico. 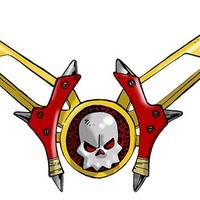 Despite her great power and large build, Mz. Ruby is cowardly and opts to fight Sly from a distance rather than hand to hand. Additionally, when Sly used Chumley (at Mz. Ruby's insistence) to get close enough to strike, Mz. Ruby killed Chumley, either out of anger or bad aim. 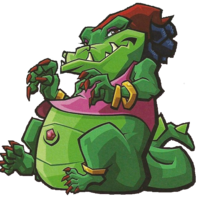 Later, one of the large mosquito guards helped Sly get to her in the battle, possibly suggesting that the local wildlife was angry with the priestess poisoning their jungle. Such instances further substantiate how a youth of isolation impaired her ability to care for others. "Hush it up! Don't you be telling me what to do!" "Hmm,.... I Could Feel That Cooper Vibe A-Coming! Most Distastefully Bad JuJu!" "Oh Sly, I See You're Mouth A-Moving, But All I Hear Is Blah, Blah, BLAH! Well,...If Jaws Need To Flap, THEN LET THEM FLAP! See You In The Next World, Sly Cooper!"